Centric brings the music and the drama when legendary multi-platinum, veteran producer and recording artist Keith Sweat presents R&B group Dru Hill with the ultimate opportunity to regain a top position in the music industry with the new reality series ‘Keith Sweat’s Platinum House’. Premiering today at 8:00 PM ET/ 5:00 PM PT, the series takes a look at the four men who make up the group Dru Hill as they search for the path of success. The challenge presented to them by Keith Sweat is simple; complete the Platinum House boot camp and record the album, ‘InDRUpendence Day’, while attempting to rebuild the brotherhood they once shared before their differences drove them to pursue solo careers. The show offers Sisqo, Nokio, Jazz and newest member Tao along with their business manager Kevin Peck the chance to reestablish their rightful place at the top of the music charts with Keith’s guidance. For the four men originally from Druid Park, Baltimore, this journey will not be easy as they individually accept the challenge to do whatever it takes to once again become the superstars they were in years past. It’s been 10 years since the super group Dru Hill released their last album. Now, a reality show called ‘Platinum House’ follows the group as they attempt a comeback. Leading the comeback is R&B legend and Atlanta resident Keith Sweat, who visited ‘Good Day Atlanta’ on Friday (February 20), to discuss the R&B group’s return and his role as the producer in the reality show documenting the process. Sweat also talked about his radio show on ClearChannel. ‘Platinum House’ premieres on Atlanta’s Peachtree TV Monday. Watch the interview below. RNBKings.net caught up with Dru Hill’s Scola for a Q&A, where he talked about his new solo album and rumors the group has broken up. “Dru Hill did not break up,” he responded. “We are very much still a group. We are all just doing our own thing right now, venturing off into different projects or business ventures but we are actually back in the studio right now working on a few things. So be on the lookout for that.” As for his new work, Scola said, “I should be releasing my solo album ‘From EA 2 Cali’ late 2007.” Rnbkings.net has since shut down. Jazz from Dru Hill and Lil’ Jon were amongst the stars on hand for the Usher album release party co-sponsored by Solstice on Saturday (March 20) at Game in West Hollywood, California. Check out pictures from WireImage. Rapper and Hot 97 radio personality Angie Martinez gave birth to a nine pound, 21-inch tall baby boy, Niko Ruffin, on June 12 in New York City. The child’s father is Nokio, whose real name is Tamir Ruffin, of Dru Hill. Niko is the couple’s first child. 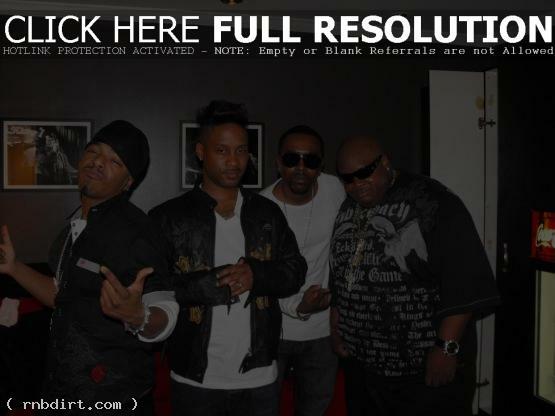 WireImage has photos of Dru Hill at the Fox Theater in Detroit on Thursday (June 12). Check out pictures from the event here. The New York Post reports Dru Hill’s former manager Kevin E. Peck has filed suit in Baltimore against the group claiming they’ve bilked him out of a fortune in management fees by breaking the contract they signed with him in 1996. Peck claims he discovered the group way back when they were “playing pick-up gigs for bus fare.” Dru Hill is currently managed by Ken Crear, who couldn’t be reached by the Post for comment. Allhiphop.com reports that in an on-air baby shower, the staff, admirers, and friends of Hot 97’s Angie Martinez wished the expectant mother well as she worked her last day at the station before her maternity leave. Martinez received many expensive gifts that filled the station. Dru Hill’s Nokio, the father of the baby, said that he was ecstatic about the prospect of having another child and being with Angie. Musiq, Ashanti, Dru Hill, and B2K took home awards at last night’s Soul Train Music Awards in Pasadena. “I feel very, very very good,” Musiq said after winning best male R&B/soul single for the second year in a row with ‘Dontchange.’ “I feel honored and I feel grateful.” The full story at cnn.com has since been removed.